I seem to get this question a lot! I thought I would write a regular post about the way I carry my coupons. More detailed information about my insert organization can be found HERE. Minutes! If I have more time and I’m in the mood, I’ll spend more. I just put them in my filing cabinet. I use the Couponizer that I carry with me, just because it is small and easy to carry in my purse. I would LOVE to have a large binder or box but I’m afraid that I would lose it or my husband would commit me. He loves that I save so much but thinks I’ve become that “Coupon Lady”, and I’m only 30! Haha! I tell him that there are a lot of ladies that are younger then me doing this too. Besides this is the new Frugality. If you don’t want to order the Couponizer or you think it is too big then use envelopes to hold your coupons in your purse. Start small and as you begin the process of finding deals you will discover the method right for you. 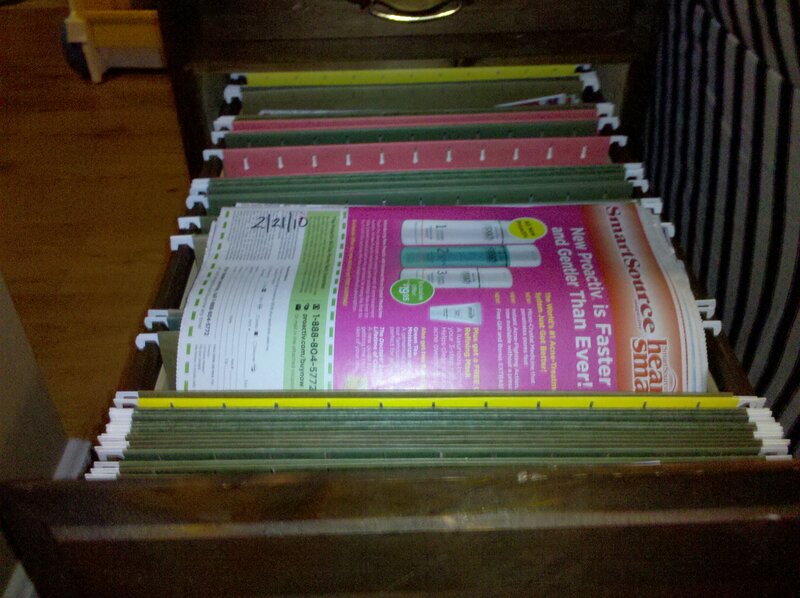 Since I don’t have a lot of time because of my family I don’t like cutting all of my coupons so instead I keep the inserts and store them in a filing cabinet by date. Then when I need a coupon I just find it by date. Super easy. If you are looking for a filing cabinet check out yard sales, Craigslist, or even Freecycle. When I have time and I’m in the mood. I will take the multiple inserts and organize them together. I write down the date and number of inserts in the packet. If there are multiple Smart Sources I will write down if it is SS#1 or SS#2. Then I put them in the my filing cabinet. With the most recent date in the front. Super easy! How do you organize your coupons? Is this easy for you? Do you have an easier method?